Note: The photographs by Pepita Seth have been reproduced with her special permission. As the monsoon ends and the landscape glistens in restful shades of emerald and sapphire, there bursts forth in the North Malabar region in Southern India, fiery forms of supernatural Beings. Sporting extraordinarily ornate headdresses that sometimes rise several feet in the air and carrying flaming torches, these Beings appear, move, leap, speak, and dance in front of shrines, altars and village homes. These are the Theyyam gods and goddesses - incarnating in fantastic forms that seem to transcend human imagination - and this is the famed Theyyam Festival of Kerala - a spectacular mix of indigenous music, pounding drums, dances, rites, rituals and tribal customs. According to Pepita Seth, a dedicated Theyyam researcher, “it encompasses a complex universe centered on the belief that a man can - after suitable mental, physical and spiritual preliminaries - don the costume of a particular deity and then become that deity. In this elevated state, he assumes superhuman and divine powers”. This pantheon of the Divine is extensive, and according to Ms. Seth includes not only gods and goddesses, but warrior heroes, ancestors, animals, ghosts and spirits as well. These deified forms are welcomed with great respect and reverence by the villagers for they are believed to be unpredictable in nature and endowed with the supreme power to either bless or curse, to protect or destroy, to nurture or nullify. The Theyyam Festival is unlike any celebration held in any part of India. Dating back to two thousand years, the Theyyam deities are said to have their origin in the Dravidian culture and the indigenous customs and rituals. For centuries, its practitioners have belonged to the various communities of “untouchables” that have existed as part of Kerala's caste structure. As Pepita Seth points out, “a key social aspect of Theyyam was, and sometimes still is, that it gave a voice to the downtrodden, and also an outlet through which, in trance, they could speak of the injustices inflicted on them by the higher castes. In trance the performer is divine, he is the supreme and absolute authority, what he says must be heeded to.” Thus the Theyyam Festival served as sort of a social equalizer, bringing together people of all classes and tribes through religious participation. Today, even though the social degradation associated with belonging to the low caste has been eliminated, the art form itself has remained under the sole custodianship of these traditional families and it is through descendants of those communities that this ritual performance is practiced and kept alive. Himself a puppeteer, mask maker and Artistic Director for many traditional performing groups, Nair has worked diligently for nearly 25 years with various masters of lesser known traditional performing theater, dance, puppetry, and music in Kerala. In an interview, he spoke with me about this mysteriously unique performance-ritual and its significance and power even in this age and era. RB: I understand that Theyyam, is a folk ritual that is over 2000 years old. Can you give some historical background on this dance form? RGN: We cannot pinpoint a precise date for its origin, but it is certainly older than any popular performing traditions of Kerala. Some of the present day Theyyams are recreated at the Kingdom of Cirakkal, near Kannur may be 1000 years ago by Manakkadan Gurukal, a great guru of martial art. It is believed that he designed 35 Theyyams according to the request of the Cirakkal King. RB: Is each of these Theyyam a separate dance with separate deities and does each dancer represent a deity individually? RGN: Yes, of course. Each of them becomes a different person with different qualities, functions and stories. One dancer can represent more than one deity but the rights of representation are strictly regulated and divided between the cast and communities. Even within each community certain families have special rights on certain Theyyams. RB: What is the significance behind the "male performers ONLY" tradition? If it is the sheer physical strength that is required, then do you think that in this age of female participation in endurance sports etc, women could find the strength to do this and would you encourage this or accept local or foreign female students? RGN: Most of the Theyyams are performed by male dancers only, except one particular Theyyam performance that is held in the Kannur area once in two years. This is done by women performers only, because the story is about a noble lady and it is believed that no man can represent her at that moment. But certainly, no one outside of the traditional families is allowed to perform or learn. RB: It is fascinating that besides the stories of goddesses and gods from the mythology, the Theyyam dancers also enact stories of local heroes and heroines who have been deified. This is the most ingenious way to acknowledge the heroes of the community and to immortalize history through the arts. Do you think it was done in order to record history in a unique way or do the people really believe that these human heroes have turned into gods with the powers to bless or curse? RGN: Traditionally the way it happened was that many of the heroes - male or female - had made their presence felt after their death in the village in a house or in the palace or in a shrine through some extra ordinary situations. Through the help of astrologers, the local people have found that it was the will and desire of these spirits to appear as a Theyyam. Then the chief of the performer community would create the costume, which we call as the body for the Theyyam and the rituals that go with the body. But actually for the last 600 years or so, we have not created any new Theyyams. 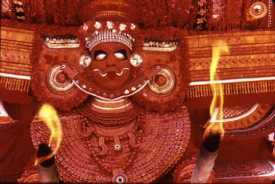 RB: Are there separate temples or altars for the Theyyam deities? Do private families arrange for Theyyam to appear at their homes as a blessing or are they done only in a temple? RGN: There are separate Theyyam shrines for each of the Theyyam gods - some times each of the shrines can have a group of Theyyams. The two Theyyams that we are touring with are Muchilottu Bhagavathy Theyyam, which belongs to the Community of NAIR and Kathivannur Veeran, which is of the EZHAVA community. Many of the Theyyams can also be done in private families in the temporarily built shrine. RB: What do you think is the reason for the popularity of Theyyam even today? Is it looked at even today as a socio religious ceremony or merely as entertainment? RGN: Theyyams have a very big role even today in the general life of people in north Kerala. 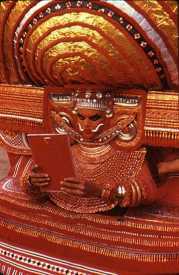 People go to a Theyyam in the temple and speak about any family problems, health issues, or social problems, and they are given answers to their problems. But the dancer will never go into a trance or ecstasy - these two words will not fit into any of our performing traditions. We do not differentiate the dancer as a person possessed by the spirit of the deity. The dancer becomes the deity. RB: Do your dancers go through ritualistic physical and mental preparation in order to bear the shakti/energy of the metamorphosis of turning into gods and goddesses? 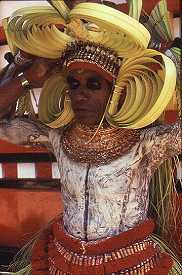 RGN: Actually the belief is that the costumes and painted mask-like makeup is the “body” of Theyyam and that the performer is like a vehicle that carries it and the dance. So once they get into the costume they are in contact with the God - Theyyam - represented by that costume and that contact will not change and throughout the dance, they will remain in the same attitude. The exact point of change happens at the point of mukhadarshanam (seeing the face). This is when the headdress is placed on the artist in front of the altar, and he is shown a mirror. When the human artist looks into the mirror he no longer sees himself. He sees a divine being and from that point he turns into that Being. RB: It is your costumes that creates that fantastic other-worldly vision. How long does it take to prepare for an evening's performance and how much do those headdresses approximately weigh? RGN: It takes us anywhere between 11 to 36 hours to create each costume with bamboo and textile - silver decorations etc. The face painting and preparations on the performance day is 4 to 5 hours. The headgears are of different types, some are more than 22 feet high. RB: In the ancient Tamil Sangam literature, we find rituals similar to Theyyam especially in particular reference to a ferocious tribal goddesses named Kottavai and also the name of Velan, which today as a Theyyam community has been mentioned. Is there a major connection between the Tamil culture and the Theyyam dancers? RGN: The Tamil connection is very normal for Kerala. Until the states got divided according to the language, Tamil remained the SOUL of the southern culture. So there is a definite connection. And yes, even today certain Theyyams are performed only by the Velan Community. In our traveling group, the dancers are from Peruvannan community, while the drummers are from Malayan community. The Malayans also perform Theyyams but they use more natural materials and their gods are more of the Tantric origin. RB: In the Bhagavata Mela dance drama of Prahlada Charita the character of Narasimha has to be appeased in a special way and so for this reason, they say that this dance drama is never performed outside of the Melattur village. Do you have such restrictions? RGN: There are certain Theyyams and rituals we cannot bring out side of its world and we will never do it also. RB: When you perform such ritual dances outside of the shrine, does its meaning, purpose and social significance change for you? Do you perform it simply as an entertainment or do you think of it as an extension of local rituals of blessings for global prosperity and well-being? RB: In India there is a tendency for the locals to acknowledge something that is in their own backyard only when the "foreigners" recognize it. Anna Pavlova had to point out Bharatanatyam to Rukmini Devi and students from abroad had to get involved for the immense popularity of yoga to happen. What is the present status of Theyyam in India as an art form? Do you anticipate that your tour abroad will dramatically add to the status of Theyyam in India? RGN: Theyyams can't be in the professional art list, but the status of Theyyam never went down like other performing art forms. In our country until the British came, most of the traditional arts had a very good patronage from kings and landlords, but modern India failed to recognize the traditional school and the social status of the tradition went down. That is why the next generation refuses to learn the art. Now many people have begun their work to create awareness among the youth. The support of international community is very vital for the protection of tradition. Sometimes we need that to make our own people to look back and recognize the value of our own tradition. She is an auspicious protective form of the Goddess. Decked in elaborately ornate costumes, a large (almost five feet in diameter) headdress and false golden eyes, the Goddess Bhagavati is on a journey from Mount Kailasa to the Eta Lokam (the Region of the Left - of the Tantric tradition). On her way she reaches the garden of king Padanaayar at Muchilottu. She drinks water from the king's well and bathes and dresses herself. She changes her warlike hand props for peaceful ones - a ritual sieve as a symbol of discernment and a brass trident as a symbol of the three worlds. She then performs a ritual dance in order to sanctify the place before disappearing. This is a story of a deified warrior hero. While fighting against invaders he was killed and his body was cut up into 64 pieces by his enemies. 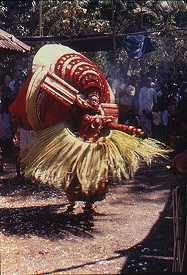 The Theyyam enters backwards on to the stage to indicate his arrival from the underworld. He searches for his wife Chammarati who is desperately trying to identify his body. His dance depicts his life and his love for Chammarati, his desire to help his friends in combat, his death during the war and his wish to protect his body from the animals and to show them to his wife. The end of the dance celebrates his happy reunion with his wife after her death. Pepita Seth: Born in London, Pepita's first visit to India was in 1970, to retrace her great-grandfather's diary account of his 1857 march from Calcutta to Lucknow. In 1979, she went to live in Kerala for 7 years and was granted temple entry permission in 1980 (Kerala's temples are generally off-limits to outsiders). Since then she has been photographing and documenting the wide spectrum of Kerala's ritual universe. She is author of several articles on the subject, has lectured extensively and written one novel (The Spirit Land - Penguin-India 1994). She has had several exhibitions of photographs in India, England & the United States. Her most recent work has been spending 7 years with the Theyyam performers and one year in Guruvayur temple.